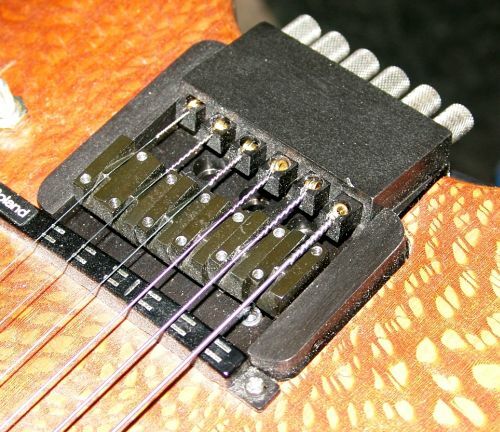 Finding headless guitar parts can be a challenge but fortunately, machinist Jon Bondy is making fixed bridge replacements for the headless Steinberger Trans-Trem, S-Trem, and R-Trem bridges. Tuning knobs and the associated threaded rods are stainless steel purchased parts. The Trans Trem, on the other hand, weighs roughly 1.3 pounds so the Bondy bridge also presents an opportunity for significant weight savings. The impetus for the current bridge project came about as the street price of the Trans Trems (TTs) began to rise, and people began to remove them from their guitars, to sell. They wanted a way to keep the original guitars as functioning instruments, but fixed bridges were not available. Also, quite a few people never used the trem features at all, and wanted a more stable and simpler bridge. Jon ended up designing a bridge but then found outsourcing in quantities of 10 or so cost-prohibitive. Instead, he took it upon himself to make them in his home shop. Some of the parts (tuning slugs and saddles) are very small parts that require a lot of care, and there are a lot of them: I usually do them in batches of 100, and it takes days of very boring and repetitive manual operations. The other is that all of the parts require surface treatment, so that everything is a uniform black, and this step requires a minimum number of parts, and takes over a week at an external vendor. Price for the six-string fixed bridge is $350. To find out more, see the Bondy headless bridge page. There’s also a 12 string bridge in the works which we’ll cover as details become available. Many thanks to Jon Bondy for permission to reproduce the images above as well as his generosity in sharing his headless bridge with BTEG readers. Ok, so as a newbie to the whole ergonomic guitar field, i Ive really enjoyed all the information here- its been invaluable, and ive learned a lot. but what is the true ergonomic lure for headless guitars? is it a weight /balance issue? if so, is it demonstrably significant? all design factors being equal, if i took the same body and A/B’ed necks on it ( i know youd have to switch some hardware too), would i notice an appreciable difference? or is it just its own tradition from the Klein/Steinberger legacy? For me , it seems that the difficulty in obtaining parts, the wearability of said parts, the expense of good custom parts, string compatibility, etc. outweigh the advantages as i understand them… so Im wondering — am i missing something here? To outfit my proposed 12/6 doubleneck with something as good as Mr Bondy’s (and im not questioning the price, don’t get me wrong, its more than fair for the work involved) I’d estimate conservatively 1100 dollars or more. To me, thats a lot of money to *not* use a regular neck and tuning gears. Am I getting 1100 worth of ergonomic benefit? im not grasping the advantage or value in a headless setup. Great question, stefan! So good in fact that I’ve answered with an article – Ergonomics and Headless Guitars. Without a weighty headstock and keys, you have a better opportunity for balancing the guitar in such a way that the neck can remain at an ergonomically appropriate angle. 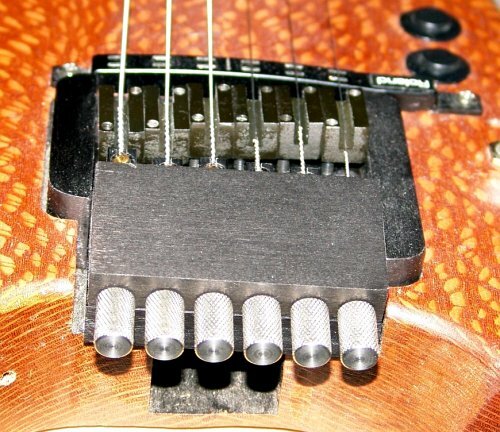 Strap button placement is important, too, and of course non-headless guitars can balance. But by reducing that weight, you open up ways to design/shape your guitar that would otherwise produce a neck-heavy instrument. I think a big part of it is also aesthetic. It seems pretty common for fans of ergonomic design to also be fans of the minimalist look of headless guitars. So, I think ultimately both of those factors are important– “headless design” just seems to fit the culture of ergonomic guitar design, but also there is a practical issue in terms of creating a balanced instrument. 1. 12th fret is naturally placed higher up on the neck, not really the neck, but compared to your bodys position. Can be tricky nailing it, while switching between guitars. 2. The wiggling and bouncing around of the neck while playing. I’ve yet to see any other person around here taking this topic up, which IS related to ergonomics. If you’ve read my long winded posts, you may have come across this. It has to do when playing for a long time, and you get your speed up slightly, and wants to do chord changes very fast UP AND DOWN the neck, the headless necks seem to wiggle (lever effect) out and in from the body. This is because the thumb of the fretting hand can throw and “nick” the neck out of balance at that tiny point while just MOVING your hand up above the 12th fret. This is the same for basses, and actually, regardless of body design and body weight. This makes you – more often than not – MISS some of the strings way up at the neck, when trying to finger it properly. Read my post of having the guitar completely rigid and still.I e removign the guitar from the body altogether. I’ve tried this on HEADSTOCK instruments and the head, with its added weight, adds some kind of counterbalance to this, which makes sense, that it just ain’t that easy to knock the neck forward (out from the body) with just the force from the fretting hand thumb. This is happening only in extreme playing conditions, but nevertheless, has been occupying my mind for quite a while. I notice it, and sometimes it hampers my playing. On other guitars (headed) I don’t have to hone it in. On headless this seems impossible to hone in, i e practicing to avoiding it. Try this for yourself. I mean, this is quite esoteric nitpicking but nevertheless. And you remind me of another interesting point and that is the advantages of freeing the guitar player from supporting the instrument at all through the use of a guitar stand. but the speed which you move your hand, i e speed while not playing anything, the moving part. Anyone can try the following experiment. 1. Try play any note at the first fret, with a metronome. Modest setting say 100, at the NEXT tick, try to have (make it) SLIDE AND GLIDE that note up to one octave above on the same string that one you’ve just played. Do this on a headless guitar. 2. Do the very same on ANY other guitar with headstock. 3. The note you play should be sounding, while you’re moving it, it is musically called glissandi. 4. Do the same again, but WITHOUT it sounding as a glide up towards the octave. Lift your fingers properly and not produce ANY string noise. 5. Take notice of how the neck moves in and out, it wiggles slightly – if only ever so slightly – and take notice on which guitar you NAIL the octave note, more securely, and safely. Of course, no one owns the very same guitar, with a headstock version, and headless version of the same make and model. They don’t come like that. I don’t even know of any Steinberger models that come with that as a choice option. One can’t take – say – The Ovation Deacon/Breadwinner and try this, and then compare it with a Klein. This is a better experiment to produce on bass, because basses are more prone to this because the longer scale/neck and the greater amount of pressure one needs to press a thicker bass gauge string down. Funny thing is that this is regardless of the instruments weight. You don’t have to be an Yngwie Malmsteen shredder or Victor Wooten on bass. In fact, I find it more troublesome when switching chords FAST between the first frets and something upwards above twelfth. It has to do with the thumb on the fretting hand, which I use only as a STOP, to stop the neck from moving inwards, when fingers on the opposite side press anything down on the frets. Now, if you keep you elbow still and keeping the 45 degree angle as many of the teachers has taught us before (the bass guru in one of the other threads, Friedland I think his name was) the ARC WHICH THE THUMB MOVES ALONG WITH THE NECK, is enough to put or push the neck out a bit when it hits the peak, and also causes it to wiggle a bit too much. Now, my findings has been, that on any headstock guitar, bass, or even semi acoustic hollowbodies, this is just not as pronounced. I feel a bit bad for Jon as the comments (although very good) for this article really ignore the fine job that Jon has done in providing a well made fixed bridge that fits in a S or T trem cavity. I have been testing one of Jon’s bridges in both my Klein and in my GL. The Klein originally had a TT and the GL an S trem. I was very impressed with the sound of the Klein after getting the fixed bridge in place. A veil seemed to be removed from the guitar when played acoustically and the sustain and clarity through my Carr Rambler was a level above what it was with the TT. Now I am the first to admit that I am not a trem guy and only used the TT for trem not transposing. I do not miss the trem capability and I know that others will. I just wanted to give Jon’s bridge a vote of confidence and let others know it is a very valid option when building a headless guitar. I will also have Jon’s bridges on the guitars that Rick Canton builds for me. I had exactly the same experience when mounting the Bondy Fixed Bridge to my Klein. It is an excellent, well made, great sounding option for anyone who wants to go headless. I just received a prototype 12 string version from Jon Bondy. I plan on creating a quick jig or put together a quick prototype guitar to test out the bridge. I will give a review when it`s all tested out. Give me a month or so, I`m busy working on the 2 top pictured ergo models and that is currently the priority. I will say the work looks fantastic and things work with just tweaking around with my hands…more to follow. Looking forward to your review, Rick. We’ll be sure to feature it for all to see and enjoy! When you say “I cannot contact jon bondy”, what do you mean? Emails bounce? Emails are not answered? I suppose your messages might be making it into my Spam filter, but without knowing when you send the message(s), I can’t check. I’m not sure what to suggest. Try jon_bondy@yahoo.com to see if we can punch a message through that [deprecated] back door. Please send me a quote and info. on your replacement bridges–thanks! Last spring, JCustom, a Korean company which has been producing and selling the XS-Trem, announced that they were going to be producing a fixed bridge by the summer. The price was likely going to be between $150 and $250. With my bridge costing $350, it seemed unlikely that I would be able to compete, so I stopped manufacturing my fixed bridges. I have not heard that the JCustom fixed bridge has arrived yet (despite original estimates of June or July), but at this point, they may be the only game in town. If you want to place an order with me for 50 bridges, I might be able to quote you on that, but I cannot afford to make them in batches of 5 or 10 and try to compete with the Koreans.